2020 WATCH -- DAVID SIDERS: "Harris advisers plot 2020 strategy: 'The SEC primary meets the West Coast offense'": "Sen. Kamala Harris' advisers are privately discussing a rough Democratic primary strategy that would focus heavily on Iowa, but with an eye toward high-value nominating contests coming later in Nevada, South Carolina and California — more diverse states where her candidacy might resonate with larger minority communities. "Harris, a first-term senator, would still face significant obstacles in each of those states. But as a black woman who has also won statewide elections in California — where the black proportion of the electorate is relatively small — Harris could be well positioned to compete in both the Southeast and the West. I am so done with BOOMERS! 2020 WATCH -- WAPO'S MICHAEL SCHERER in King of Prussia, Pa.: "As his newly adopted party hugs the left, Michael Bloomberg aims for the center": "Wall Street billionaire Michael Bloomberg, a former Republican mayor who once spent $10 million to reelect Pennsylvania's sitting Republican senator, was an unlikely choice to keynote the local Democratic Party's fall dinner here on Sunday. 2020 WATCH -- DAVID SIDERS: "Decision time arrives for Democrats mulling 2020 bids": "The midterms are over. So when will top-tier 2020 contenders announce, already? The Democratic Party's victory in the House on Tuesday removed a major barrier for many likely candidates, who'd been waiting out the midterms for the sake of propriety and to see how vulnerable President Donald Trump seems. Had Republicans kept the House, several Democrats would likely have taken a pause. In 2018 the D's were defending 23 Senate seats, the R's 10. The 2020 Senate map almost reverses with R's defending 20, D's 12, and one unknown. 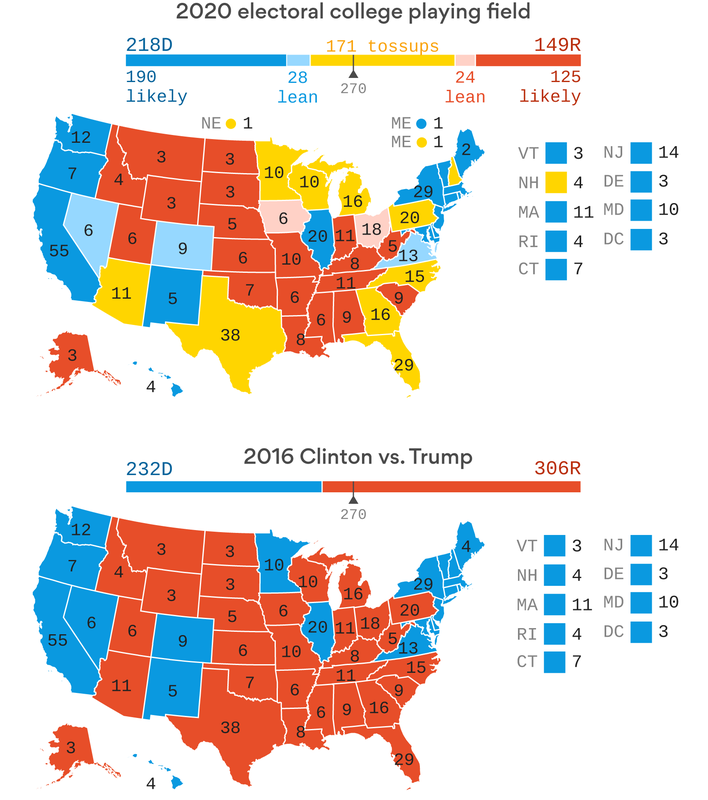 "Changing demographics and Trump have blown up the electoral map that has dominated American politics since 1992," said Doug Sosnik, a White House adviser to President Bill Clinton who is one of the best trend detectors in U.S. politics. I asked Doug, who started in Democratic politics in Michigan in 1982, to parse the implications of his analysis for each side. SAN ANTONIO — For a quarter century, Republicans have dominated Texas politics so much that the Democratic minority has often been an afterthought. The big political battles in Austin have been fought between conservative and centrist factions within the GOP, as Democrats watch from the sidelines. 2020 WATCH -- ALEX THOMPSON: "Steyer takes step toward 2020 presidential bid": "Former billionaire investor, climate activist and impeachment agitator Tom Steyer will take several steps toward a 2020 presidential bid Tuesday. That will include a six-figure web ad buy on Twitter, Facebook, YouTube and Instagram, along with a full-page ad in USA Today and other Gannett newspapers outlining a political platform, a revamped TomSteyer.com and the announcement of five town halls across the country, the first of which will be in the crucial early primary state of South Carolina, according to copies of the ad and platform provided to POLITICO. What is a 'former billionaire investor" ? He co-founded a money management company. Managed investments for institutions, high net worth individuals etc. Sold his interest and now devotes himself full time to advancing environmental and liberal political causes. Reputedly has spent $100M in 2017/18 on TV ads urging people to sign his petition to impeach Trump. Pelosi, Schumer etc. are not in the slightest bit interested in impeachment preferring to focus on winning elections. He may compete with Bernie and others for the progressive D vote in the 2020 primaries. If the choice comes down to would you prefer someone who inspires you, or someone who can win, and it could come to that, he'll be on the inspire side, and I'll be on the win side. 2020 WATCH ... THAT DIDN'T TAKE LONG! -- "Beto O'Rourke changes his mind: He's not ruling out 2020 anymore," by David Siders in El Paso, Texas: "Beto O'Rourke said Monday that he is no longer ruling out a run for president in 2020, a reversal that thrilled his legion of loyal supporters while clouding an already-crowded Democratic primary field. There will be no Clintons (probably), no Kennedys (probably) and no Obamas (probably) — leaving a wide open field for the 30+and counting Democrats thinking about running. "What the hell is the strategy? California early voting starts at the same time as Iowa. Do you camp out in California and try to rack up delegates? Do you do the traditional Iowa organizing? Do you justraise money so you can be on the air in the Super Tuesday media markets?" 2020 WATCH -- "'He was willing to be tough': Beto supporters brace for 2020 brawl," by David Siders in El Paso, Texas: "Beto O'Rourke says he hasn't decided yet if he will run for president. But here in his hometown, his supporters are bracing for a combative primary. And they point to a previous campaign — his 2012 run for Congress — as evidence that he can hold his own in an intraparty brawl. The D's who are anticipating up to 30 candidates to run, have announced they will hold 12 primary debates. Six in 2019, and six in 2020. They haven't yet figured out how they will handle thirty people on stage all looking to speak. Each debate may be held over two nights, making 24 debates, but not yet decided how decision about who goes first and second night will be made. 2020 WATCH -- NATASHA KORECKI: "California's 2020 shadow sparks New Hampshire fears": "California's newly instituted March 3 primary date is rattling the early presidential state map, as Democratic state and party officials grapple with the shadow cast by the nation's most populous state. "It is hard to recall a recent presidential primary where, at the outset of the race, there was this much genuine mystery — not only about who would eventually emerge as the nominee, but who planned to run at all." "It is not difficult to imagine Ms. Warren emerging as a kind of good-government buzz saw on debate stages dotted with billionaires and super PAC beneficiaries. Whether or not voters thrill to her persona or policies, there may be no candidate better equipped than she is to help set the rules of engagement around political money and the 2020 field." "Well, that I don’t know. You’d have to ask her psychiatrist."